These are the highlights from a discussion that I found to be especially useful and enlightening, about violin design and resonance, and what these means for people searching for the right violin. A lot of knowledgable people really delved in deep, describing the physics of the violin. I have edited the discussion to its most essential points. Darlene Roth: "How can a violin produce a compatible set of notes when the violin (body) itself has discrete and limited resonance characteristics? I do not question that I can get any pitch per vibrating string arithmetic but that is not the same as tone quality or volume. For instance, how can an open string "E" and "G" coexist if violin behavior is not essentially similar at those frequencies? Finally, does all this suggest that poor intonation is possibly a matter of tone quality in addition to pitch problems? Adrian Heath: There are some "big" resonances: the contained air volume (around C# on the Ging) contained air length (around open A) and wood length (B to C on the Aing. These "cover" the first two octaves. They give the tone its depth but also sometimes its "wolf-tones". As we go up on the Eing, many small zones in the plates come into play, different for each note, and different for each violin. They also determine whether the tone is dull, bright, nasal, penetrating, harsh, silky, sweet etc. as they provide the overtones (timbre) for the lower notes. - different plate vibrations interfere with each other. Carleen Hutchins and others have mastered the first two octaves in a scientific (i.e. repeatable) way, but the higher tones are much less predictable. Scott Cole: I don't really understand the question, but I will say that E and G "coexist" (?) only if properly tuned first. Also remember that E and G exist in the relationship of a 3rd/6th, an interval for which there is more room for variation than the perfect intervals. Most people, for example, don't mind that 3rds and 6ths are tuned pretty wide on a piano. Darlene Roth: Maybe the question can be simplified. If I attached four strings to a violin body and expected acceptable results, would it be unreasonable to speculate that the violin (body) has flat response which is not the case? Has anyone determined what portion of the violin volume originates from the "f" holes? Scott Cole: What do you mean by "acceptable" or "flat?" Acceptable tone? Flat response curve? Adrian Heath: "Has anyone determined what portion of the violin volume originates from the "f" holes?" Try covering the F-holes with, say, PostIt's (not too adhesive): you will lower the air resonance by many notes, but you will also lose a lot of power. Darlene Roth: Todd C, Good information re f holes. I also noticed the use of the word "evolve" and it is obvious that the odd-shaped modern violin did a lot of evolving! David Burgess: "How can a violin produce such a wide range of compatible notes? (Or are they less compatible than we would like?)" Vibrato on a violin will not only produce a pitch change, but also a tone color variation, as different vibrational modes are enhanced and diminished with the pitch change. Carmen Tanzio: Associated with each resonance is a "spread," sometimes called the quality or "Q" factor. This determines how much gain a note gets from a resonance when the note's frequency does not line up with the resonance frequency. 1. The note frequency is less than the resonance frequency. In this case, the note gets a lot of gain from the resonance. All those middle to high frequency resonances get the violin to sound the note and its harmonics. If there are a lot of resonances around the 1kHz region, all the notes will sound "nasal", like a braying donkey, as their harmonics get a boost in this region. If there are a lot of resonances in the 2khz to 3khz range, the notes will sound brilliant. If there are many prominent resonances above, say, 6khz, the notes can take on a harsh quality. 2. The note frequency is greater than the resonance frequency. In this case, the gain from the resonance drops off rapidly, but continues to add measurable drive to notes whose frequency is maybe 3x greater than the resonance. So those very prominent fundamental resonances of the violin will drive the first few fundamentals of notes playable on a violin. This gives the violin its "sonorous" quality. For more information, you can research forced, damped harmonic oscillators. Darlene Roth: Fascinating post and I appreciate mention of other literature references. Just a simple observation. Would it be accurate to say that the basic violin design was derived empirically ? Darlene Roth: I was mostly expecting that kind of answer, but then the violin design is a major accomplishment of human effort. Awesome! Carmen Tanzio: "Would it be accurate to say that the basic violin design was derived empirically?" Differential calculus would not be invented until near the end of the 17th century, so the mathematical techniques to define and solve complex dynamics did not exist at the time the violin took on its current form. However, levers (the violin is essentially a simple lever mechanism) and simple vibrating systems could be described and designed using mathematics for a great many years before that. I think a watershed moment occurred when some clever builder decided to focus on the violin forms that could played with the button end on the chest and a palm down bow grip. A few mechanical and frequency calculations would reveal the possibilities, then empirical feedback from players would finalize the dimensions of the instrument. When someone plays a violin, a second person can quickly map the strongest vibrations of the body to certain notes by touching the surface. If a certain frequency range sounded weak, one would have a general idea of what areas of the violin could be modified to strengthen the notes. I have no idea how they would empirically observe and map "brilliance". I suspect the best builders had no trouble producing sonorous violins, but if it happened to also produce a brilliant sound, they praised the gods and charged a premium price. Darlene Roth: Again, very interesting. I am always impressed to learn that much of what I take for granted was really, as you say, a "watershed moment". Trevor Jennings: There is the speculative possibility (I put it no higher than that) of undocumented input from the polymath Leonardo da Vinci somewhere along the line. He lived in the area in the relevant period and would have been known to the instruments makers. Allan B. Lewis: An interesting article in the March 2013 The Strad reviews Librum Segreti. This is a notebook written in the late 1700's about the geometry used at that time for design of the violin. An English translation has just been published in the last three years. Geometry was the cutting edge in mathematics in those years. From this geometry violins of that time were derived and the makers knew how variation of the geometry changed the violin's acoustics. Some current makers are currently working through the text, a lot of which is only incomplete notes, to understand for application to their work. Tom Bop: Unfortunately, the violin was designed way before engineers decided to design products by optimizing whatever they can easily measure. imo, "flat response" is way overrated in sound production-- but it's a much easier to measure than "sounds great!" or "moves my soul!" Research and scientific measurement have their place, but they should supplement the hand and eye of a master craftsman/artist, but never replace them. Carmen T, My unusual curiosity has to do with thinking about buying a new violin. I am making a mental checklist of what I like, what is available (at a price)and what I have heard at the professional level. All I have to do is find that ideal violin! I do not expect anyone to make that choice for me but there is one topic I need to know more about. Let me illustrate because I do not know enough technical lingo: Imagine that I play a simple C major scale and I notice that "F" doesn't sound right. The tone has suffered but the note is at good pitch according to a simple meter. In fact, I'm really not sure that the pitch is correct by ear because the "racket" of the poor tone. Maybe I find other "bad" notes (I do). problem? I once had a chance to play some $5000 plus violins in a studio and the note quality seemed to be very good and I think I played better because the violin was giving me a true and consistent feedback. Do I accept "bad" notes as the nature of the beast at moderate prices? Adrian Heath: Darlene, bad notes, caused by anarchic vibrations in the wood dominating the string, are never a bargain: they render good intonation and tone impossible. If subtle adjustment cannot cure them, keep right away from that violin. Whatever geniuses on v.com say, the instrument matters! Darlene Roth: Well, I'm glad to hear even that much so I know it is not entirely my imagination. I really do not want to have to work to rescue notes and I certainly don't want to purchase the problem. Tom Bop: If a violin doesn't play all the notes, what good is it to you? How long do you look at a car with 3 wheels? It's a challenge to find a less expensive violin that has even response and good tone, but they are out there. Persistent looking can pay off. It's much easier to pay the price, if you can afford it, and get one that offers you more. Carmen Tanzio: "Imagine that I play a simple C major scale and I notice that "F" doesn't sound right..."
One can imagine the plates of a violin as a handful of somewhat independent areas. If each of these areas are carefully carved to vibrate freely and if the resonant frequencies are distributed evenly across the playable spectrum, the notes spring easily into life and sound rich. That is half of what you pay for with an expensive violin: carefully graduated plates that provide oscillators to drive all the playable notes. The other half is the setup, i.e., strings, sound post and, very critically, the bridge cut. My personal feeling is that the bridge plays a key role in filtering out the nasal qualities of the string and highlighting the brilliance. That's why I would suggest that if you are going to take the financial plunge, you make sure you allocate some non-trivial bucks to have it setup by someone who knows what they are doing. Or buy it from a store, online or otherwise, that makes a point of carefully setting up and testing the violin. Other than that, it sounds like you can use a procedure for systematically evaluating a violin. I think the experienced professional musicians on this forum might assist. David Burgess: "Do I accept "bad" notes as the nature of the beast at moderate prices?" Depends on what you mean by "bad notes". No acoustic violin sounds the same on every note. Even the most expensive violins usually have a "bad" note or two, including a wolf note which can require a lot of skill and compensation to make the note even usable. Darlene Roth: Not bad in the literal sense. But little distractions for me, when that is the last thing I need. Peter Charles: Some violins, including multimillion £ instruments, are more difficult to play. But you just have to adjust. These violins are often more rewarding in the end. Violinists need to be flexible and adaptable. Spend more time on this aspect of violin playing and less on what rosin to use, and other trivialities, and you will be a better player. David Burgess: "Not bad in the literal sense. But little distractions for me when that is the last thing I need." We don't have any way of knowing what your threshold is for such things, and what it takes to distract you. These things are also almost impossible to describe with words. I'd suggest playing lots and lots of violins, until you get your own sense of what is normal and acceptable, and what is unusual. Or you could take someone with that kind of experience with you when you try out violins. Casey Jefferson: I suggest that one go with the instinct rather than thinking and analyzing too much. If you play a violin that you find exciting to play and without obvious flaw and is able to do everything you throw at it, then by all means go ahead. With each violin shopping you will learn something, and eventually develop your criteria of what sounds good and play well to you. Darlene Roth: Yes, I have taken a high road intellectually and now I know almost everything but the answer. Time to play. Other big decisions will have to wait. Carmen Tanzio: A soloist who needs a brilliant and loud violin with a huge dynamic range in order to project the performance into a big hall or over a loud orchestra might be willing to work around the troublesome bits of a violin because of the rarity and cost of such instruments. For everyone else, I see no reason why there should any a compromise in playability. You might be limited to small recital rooms or orchestral play, but all the notes should leap out full, easy and focused with a smooth bow. And changes in dynamics should be evident with moderate changes in bow pressure and speed. Darlene Roth: That is certainly an encouraging and welcome opinion. I am by no means a great musician but I think I would be very unhappy with a violin having too many compromises. David Burgess: Darlene, I really think you'll need to experience "good" violins to know what they are, what they can do, and what they can and can't compensate for. I don't think forum definitions will help you much, compared to experiencing a few really fine instruments (along with some bad ones). Darlene Roth: I certainly agree. However, in this thread, I benefit from the many qualified replies which makes me much smarter and saves time. And there is a bit of information that I still need. Should I expect a "good" violin to require frequent attention from a luthier? Carmen Tanzio: "Should I expect a "good" violin to require frequent attention from a luthier ?" Once you are happy with the setup, you might use a luthier to replace strings if you are uncomfortable with doing that sort of thing. Positioning the bridge can be a fussy business because violins tend to be sensitive to the location of the bridge relative to the sound post. Changes in temperature and humidity should be easily adjusted for when you tune the violin before each play/practice session. Pitch changes will be small but noticeable. Certainly within the range of a fine tuner twist or two. If the basic timbre of the violin changes dramatically with the weather, it better be one helluva good sounding instrument to put up with that aggravation. The only other ongoing maintenance is cleaning the violin and strings after each practice/play session. A soft cloth for the wood and a gentle rubbing with a cork for the strings is all it takes. It is such a simple thing. I cannot understand why people enjoy letting rosin build up on a lovely varnished surface. If you take a minute to do this every session, the violin surface will look brand spanking new even a year after heavy play. Peter Charles: You need to change the gearbox oil every 100,000 notes (especially if the are minims or whole notes) and get the air filter changed every week. Darlene Roth: Unfortunately I have only dealt with two luthiers and I wish I had gone for an oil change instead (or a root canal). What good is an instrument which I may not be able to maintain? That would be a big disappointment and a waste of money. Now, sound posts adjustments should/can fix everything but I read one report where the luthier privately called sound post adjustments "mission impossible". As far as I know there is no guild to enforce credentials for people wanting to fix violins. So how many times can I afford to experiment at perhaps $200-$400's pop? Tom Bop: It can take some trial and error to find a good luthier, but it's worth looking. There are directories of professional organizations, and contest winners are usually very good. Violin dealers can be good or bad- some are better than others, but you have to realize they're trying to sell you something! Do you have a teacher or some friends with experience? What area are you in? Can you afford David Burgess? Allan Lewis: These adjustments take months of training and years to master by a competent luthier therefore, without proper training, one should not try these adjustments on your good instruments at home. 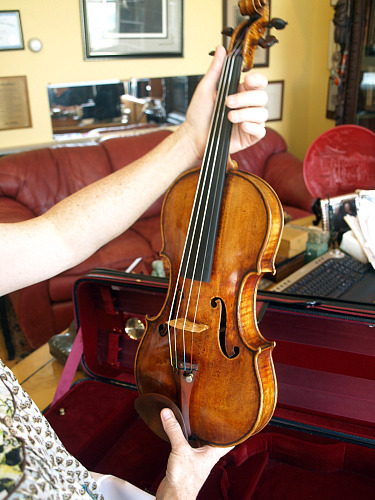 Darlene Roth: My thoughts right now are to buy from a shop that employs or is qualified to work on violins. Not just from an individual or dealer. I think this establishes a kind of service advantage. I have a good lead here in NC. When I lived in Ct. I went to a first class shop up by Amherst college (Stamell?) and I'll never get over the loss. I may have to go back. P.S. I know from the internet and papers in the literature that there are a good share of brilliant members on V.com. Darlene Roth: Carmen T., I once read that seasoned amateurs have expressed the opinion that sound post settings do not work very well because the vertical forces of a new post location (i.e. inclined plane) soon distort the plates back to the original conditions. ?? I do know that I've had "great" changes somehow just dissipate? John Cadd: Since you are choosing a violin look for one that plays harmonics easily. I don’t know what makes harmonics better on one rather than another but it would be a good thing to talk about. Also slide a finger slowly along each string as you bow to detect any unwanted wolf notes. Allow for the normal one. Carmen Tanzio: My current thinking is that the sound post location changes sound mostly by altering the efficiency with which the bridge transfers force into the bass bar foot. When you move the post away from the treble foot, more of the rocking energy goes into the treble side rather than the bass bar side. A challenge is to position the post so that forces do not exceed the yield strength of the violin plates. Otherwise the plates will just deform over time and alter how the bridge rocks on the plate. I've seen people wield a post adjusting tool like a sledge hammer and smack that post all over the place, most likely wedging the post so firmly into the plates that they will deform. A good question for the luthiers on this board is how can they tell when a sound post is placed "just firm enough"? I think if the post is carefully adjusted then any effect it has on the sound should be "permanent."